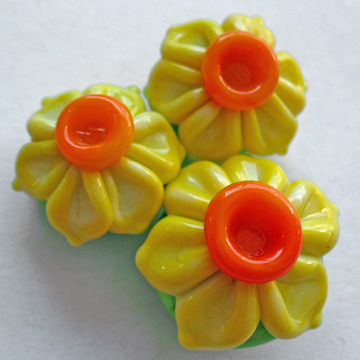 One of the best parts about working at a bead store is seeing what beautiful pieces our local artists create, from breathtaking jewelry to intricately detailed beads, and the floral motif lampwork beads created by Sabrina of Sabrina Design are no exception. We’ve been swept away by Sabrina’s floral motifs and petite ladybugs; paired with her fresh and feminine colors, these beads are perfect for the coming Spring season! 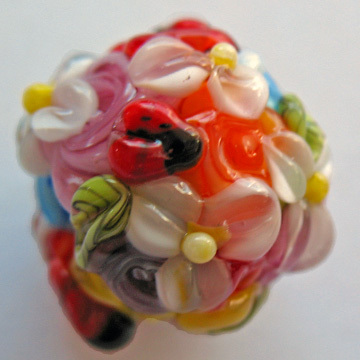 Sabrina’s beautiful lampwork beads will be available at our Bellingham store through the end of March; or you can purchase them at her Etsy shop. Sabrina has also designed her own website, proving to be a versatile and savvy lady! Make sure to stop by and marvel at her wonderful work. Below is an interview conducted with Sabrina. What kind of glass do you work with? A: The glass I use is SodaLime glass or Soft Glass. I regularly use Moretti/Effetre, Vetrofond, and CIM glasses. A: Since 2004, so 9 years. It started when I needed to fix a broken bracelet, which got me started making jewelry. I realized I wasn’t always finding what I was looking for in the bead world, so I decided to start making my own. I’m entirely self taught! A: I really wanted my bead-making to be self-supportive, so I decided to sell my beads. I wouldn’t buy new glass until I had covered my costs. A: I wanted my name in the title of the business, so people know these are Sabrina’s Designs. A: My tagline on my business card is “Funky, Unique, Feminine . . . One of a Kind.” While most of my designs are feminine, there is variety in my work. A: My sisters and my kids. I’m also inspired by flowers & color. I love looking through scrap-booking magazines; they have great images of colors, textures, and floral designs. A: My entire family has always supported me 100%. Whenever I’m selling my work at a show, there’s always at least one person who comes to show support. A: I like to make resin charms. They’re fun because they’re like mini dioramas! I teach classes & have tutorials on my Etsy page, and I designed my business cards and my website, http://www.sabrinadesign.com/ I also like collecting pictures that inspire me for my beads. A: I want to do more art shows! Since I’m self-taught, I would also enjoy taking a couple of classes, maybe in metalsmithing and Lampwork, something for fun rather than for the business.